Coyote sightings have been reported intermittently in VaHi and adjacent neighborhoods for the last decade. Coyotes have been in the metro Atlanta area for at least a quarter-century, often using riparian and power line corridors that offer relatively safe entry and passage. A coyote was recently photographed in the Orme Creek stream corridor near Amsterdam and Monroe (see related article on the VHCA website); in all probability, they have been with us for some time, along the stream in this area as well as on Rock Creek, which is mostly in a culvert in our neighborhood but surfaces permanently at the east end of Amsterdam, at that road’s intersection with McLynn Avenue and Hancock Drive. I attended a meeting on urban coyotes and the challenges they pose for humans sponsored by the Druid Hills Civic Association in late January. 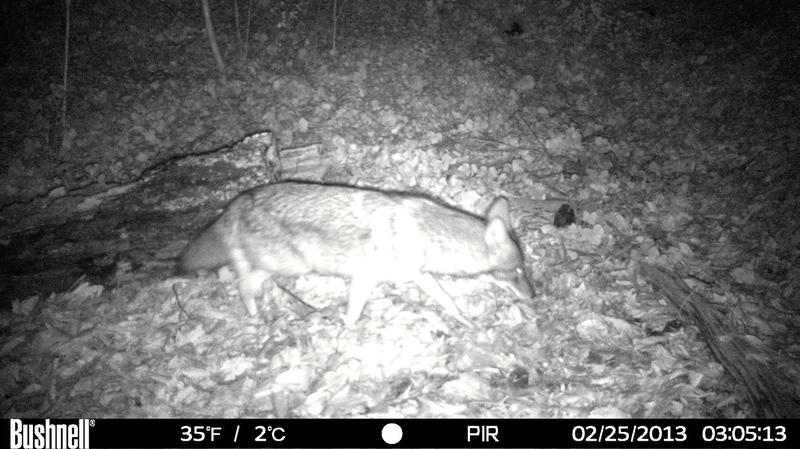 Druid Hills and Decatur have a fair amount of streams and wooded habitat suitable for coyotes, and sightings of the animals had sparked some residents to employ trappers. The trapping had itself provoked strong opposition from other residents; anecdotes and counter-anecdotes of trespassing, disappearing cats, and dogs and other animals inadvertently caught in traps had followed. The final speaker was Mary Paglieri, from the Little Blue Society (link below) in the San Francisco area, a group that emphasizes behavior modification approaches to human-animal conflicts. Her group uses tactics like habitat modification, noise generation, visual changes, and the introduction of new scents to bring about changes in behavior. Her experiences were compatible with the lessons learned from Dr. Mowry’s research; killing coyotes spurs them on to rapid increases in reproduction and a return to unpopulated areas. Trapping, she concluded, was mostly useful for the trappers’ bottom lines – the more coyotes they trapped, the more there will be to trap. It’s perhaps counter-intuitive, she said, but “If you want fewer coyotes, stop killing them.” The key to getting along with them, she averred, was taking steps to make your own yards and grounds less attractive to them. An interesting variety of questions and anecdotes followed, both in the meeting and in informal discussions afterward. Some citizens had heard anecdotes of attacks on humans; at this session no one proffered any evidence of such occurrences in Georgia, other than those that had occurred when handling coyotes that were already trapped. There are visual and confirmed reports of attacks on cats, although there were also many tales of coyotes simply ignoring small pets. The reports of coyotes reducing feral cats populations provoked mixed reactions. Several pet owners pointed out the obvious contradiction of objecting to coyotes’ pursuing prey while ignoring sanctioning the well-documented damage that our own cats do to bird and small animal populations. Eliminating feral cat colonies – some of which, like coyotes, are sustained by deliberate human feeding, ironically – was beneficial, they argued. Several studies of the diet of urban coyotes suggest that the degree of cat-coyote conflicts are exaggerated, however emotionally wrenching they may be to humans. Ms. Paglieri observed that most such losses occur when a cat is roaming alone at night. Also active at this meeting were Linda Potter, Assistant Director at AWARE (Atlanta Wild Animal Rescue Effort); Janet Kessler, a naturalist and wildlife photographer and Meta Larsson, a Candler Park resident who, together, co-founded Coyote Coexistence; as well as Dr. Larry Wilson of the Fernbank Science Center. Ms. Potter joined many others in disputing the assertion that traps were benign and do not harm animals. A report of a broken leg suffered by a dog in a trap at Durand Mill was cited; asked separately about that topic, Mr. Elliot reported no specific knowledge of it and pointed out that all dogs should be on leashes. Those of us who have spent a lot of time in riparian corridors have seen coyote tracks for years and have occasionally bumped into the animals themselves. Most are quite cautious around humans and retreat rapidly; occasionally some are curious and linger on the edge of woods. Dr. Mowry suggested that those that become publicly bold and incautious around humans may have been feeding routinely at homes, either via their own initiative or through the deliberate actions of humans who admire them. He urged education on the importance of not feeding any wild animals, a practice that endangers both the animals and humans. The consensus of the biology and wildlife communities is that coyotes are here to stay and that they pose few (if any) dangers to humans. We can all do our part to reduce their impacts on pet populations by not feeding any animals outside, reporting and removing road kill promptly, fencing our compost piles, and – most of all – reducing or eliminating our beloved pets’ unmonitored outdoor time. 2. Don’t feed pets outside. If you feel you must, remove their dishes promptly. 3. Don’t let pets roam outside in unfenced areas. Just as other smaller species are vulnerable to our pets, our pets are vulnerable to others. 4. Fences may not be perfect solutions – coyotes are indeed wily – but proper fences are a deterrent and can help a lot. 5. Call Animal Control to promptly remove road kill and carcasses. 6. Distinguish between ‘problem’ coyotes – those that boldly intrude into human spaces – and the huge majority of occasional and seldom-seen coyotes who keep to themselves. We have been living with them quite successfully for a long time. This entry was posted in news and tagged 2013, coyotes by John Becker. Bookmark the permalink.